Circus Acts and Fire Performers for Hire! Corporate Entertainment for weddings, parties and events. We are Circus Uncertainty! Providing exciting and unique circus entertainment across the whole of the UK and internationally! All the circus performers and fire dancers you see on this website are available for hire at your next corporate event. Our entertainers can also supply a whole host of entertainment including wedding entertainment, after dinner entertainment, private party entertainers, festival entertainment and more. 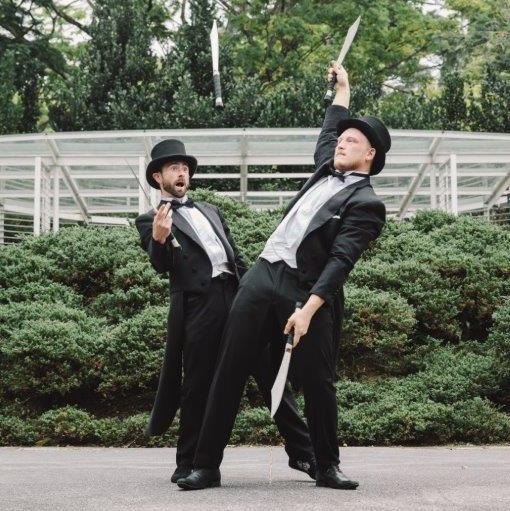 Our top quality circus entertainers and fire performers will add a touch of class to your wedding entertainment! And with our breathtaking indoor fire shows you will be sure to end the night on a high note. As we work as both a company and an entertainment agency we have performers based all across the United Kingdom. Our 5* team will help you come up with ideas for your special day! Circus Uncertainty has a history of offering both standalone circus acts and bespoke entertainment creation service. We can work with your concept and ideas creating the perfect circus based entertainment for your corporate event or wedding. We work with only the best UK based entertainers in order to offer you the highest quality service possible. Circus Uncertainty was created by Joshua Morris, a multi-talented circus entertainer from Bristol UK. Specializing in Acrobatics and Fire dance but also having acts in Diabolo, juggling, LED performance, stilt walking and outdoor street shows. Joshua concept on circus performers being multi-talented can be seen within the circus acts, Circus Uncertainty works with. As all of our artists are multi-talented, circus acrobats who can also perform fire dance, jugglers performing human statue, fire-breathing showgirls. Our multi-talented team means you can get multiple acts for just one price. Fire entertainment is a particular speciality of ours. Safety always comes first when it comes our fire dancing and our fire dancers are always fully insured (for up to £10 million) and happy to supply both passive and active risk assessments. All of our fire performers can perform inside except our fire jugglers (even the best jugglers can drop occasionally and this is something we would never like to happen during an indoor fire show), and we supply all the safety equipment to make this performance possible. From fireproof carpets to fire extinguishers and everything in between. One of our UK based fire dancers or fire performers can even come to your venue to run through how we safely perform with fire inside, prior to the fire performance. However, some venues can be deemed too dangerous to perform fire inside because of the sizing but this is something we will always inform you of prior to the booking. Our fire performances always have something unique whether this is a mixture of acrobatics, dance or just some of our unique fire performance props. This means whether this is your first time seeing a fire show or your 100th, we're sure you'll see something you've never seen before. Open 9am til 6pm Monday - Saturday. For last minute entertainment please call our mobile any time! Only ever had 5 star reviews from our clients!